Male pattern baldness affects millions of men. Everyone loses some hairs every day, about 50-100. For most men these hairs are replaced soon and there is no problem with baldness. The problem occurs when more hairs are lost, and not as many are replaced. Every hair follicle has a normal cycle that it goes through. When follicles become weak, or eventually stop going through this cycle, then you have hair loss. The cause of male pattern baldness is most commonly a condition called androgenic alopecia. Some people say instead androgenetic alopecia, but that's not correct. However it's said, it means the same thing - hair loss. So Androgenic alopecia means hair loss due to hormones. The most abundant androgen in the body is testosterone. Testosterone gets used (metabolized) in the body, and becomes dihydrotestosterone, or DHT. DHT is your hair's worst enemy. It strangles the follicles, suffocating the hair, which makes it thinner and eventually kills the follicle completely. There are three phases that every hair goes through. Anagen refers to when the follicle is actively pushing the hair upward. It takes a lot of cellular activity to make this happen and the follicle is a busy place. This phase varies in length between one and four years. Catagen means when the activity of the follicle is declining. The follicle will begin to move toward the surface, and activity slows down. While the anagen phase lasts years, the catagen phase happens in less than a month, sometimes just two weeks. 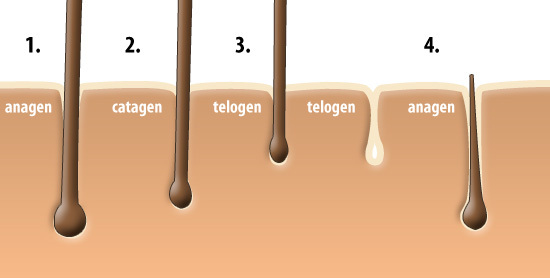 Telogen is the end of the cycle for the follicle. This is sometimes called the resting phase. This lasts between two and four months. During this time the hair may fall out, as it is much closer to the surface and there is little or no activity in the follicle. The follicle then enters the anagen phase again, beginning to grow a new hair. At this point the old hair may be pushed out if it was still there and hadn't fallen out already. The activity has resumed, and will continue on this same pattern. 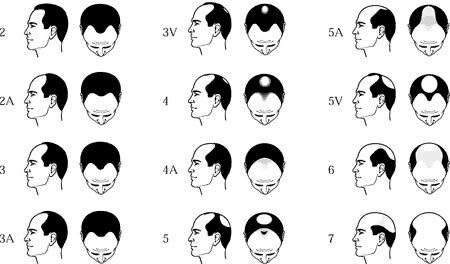 In male pattern baldness, the problem is between phases 3 and 4. DHT makes the follicle less active, and it produces a thinner hair. It can also lessen the amount of pigmentation that goes in to the hair, which explains why some men notice a lighter color of hair in their thinning area. As the hair loss progresses, existing hairs are thinner due to less activity taking place at the root level. This gives the 'peach fuzz' appearance of the hairs in the area. If you are at the beginning of noticing a problem, this is the perfect time to stop thinning hair. Catch it as soon as possible and you have an excellent chance to put an end to the problem. Eventually the follicle is so weak that it never re-enters the anagen phase, remaining inactive permanently. After a follicle has been in this state for a while, you can kiss it goodbye in terms of growing a new hair. This is why it is so important to stop thinning hair early on, before too many follicles become inactive. Once it's gone it's gone for good, and no treatment has any chance to regrow that hair. Once a thinning hair has stopped completely, it is gone. The only option becomes a hair transplant. If you've been reading up on hair loss, you've probably come across the Norwood scale. This chart shows how hair loss progresses. There is no #1 on the chart since that represents no hair loss at all. You want to stop thinning hair as soon as you notice it. Preferably before the 5 area on the chart. Remember, once a follicle has gone totally dead there is no way to bring it back to life. Luckily, even at 5 on the chart, there are a number of follicles that are in the resting phase which can have activity restored to them with laser hair therapy. Male pattern baldness is best caught in its earliest stages. 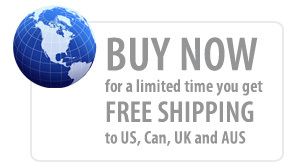 Lasers can help restore life and activity to the follicles which were being suffocated by DHT. By energizing these cells, they get back to the business of making your hair grow thicker and fuller, and within a matter of months you can see a visible change in your appearance.